The St. Jerome Library has a collection of over 1,500 books and DVDs for adults, young people and toddlers. Librarians peruse each book and catalogue them according to the four parts of the Catechism of the Catholic Church - Profession of Faith (Doctrine), Sacraments of Faith, Life of Faith (Commandments and Moral Life) and Prayer. For younger readers, there are books on the Saints as well as Bible stories presented in Rhyme or Comic-Strip formats. There is also a good collection of board books for toddlers as well as the all-time favourite Beginner’s Bible and Veggie Tales DVDs. 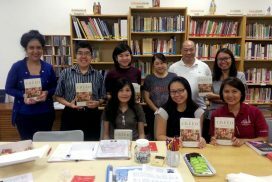 In addition to the cataloguing and labelling of books and AV materials, St. Jerome organises two “book-club” sessions every year. A book is selected and librarians facilitate the reading over a few weekly sessions. As a Librarian, you will not only become familiar with the vast array of Catholic doctrinal and spiritual writings, you will also progressively develop a lively understanding of the faith as we read and prepare for the facilitation of the ‘book-clubs”. and is open every Sunday from 8.30am to 12.30pm.